iPad 2 Rumor: Bigger Speaker, Flatter Back, Very Slightly Smaller? The closer we get to a potential iPad 2 release—and we're still probably several months away—the more questionably sourced rumors will pop up. 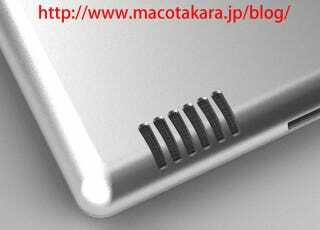 This one, from a Japanese Apple-enthusiast blog, at least explains that weird case from before. That blue circle is where the current iPad's speakers are now—and bigger speakers mean a bigger opening. Makes sense! Other rumors coming from Kanteidan include a flat, iPod Touch-like back for the iPad 2, and a case that's 239 mm by 186 mm instead of the current model's 242.8 mm by 189.7 mm. No change in display size, so we could just be looking at shaving something off of that unsightly bezel. The iPad is supposed to ship from manufacturers in January, which would roughly line up with the expected April release.